Plastic is really useful and we use it every day. But what happens after we throw it away is causing a big problem for our planet. It's thought more than five trillion pieces of plastic are in the world's oceans and it can take years for it to break down. Plastic is in lots of things we use from clothing to crisp packets, and bottles to buckets. Making things from plastic is popular because there are many different types and it can be made in to all sorts of shapes, colours and sizes. Plastics are man-made and can be produced from natural materials like coal and oil. The first synthetic plastic - plastic made entirely from man-made materials - was created over 100 years ago. It was called Bakelite and was invented by Belgian chemist Leo Baekeland in the early 1900s. 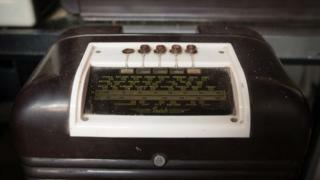 Many think Bakelite was the start of plastics as we know them today. 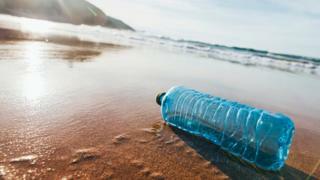 How do we use plastic? People can pretty much do whatever they want with plastic. It can be coloured or clear, thick or thin, strong or weak. This means a lot of different things can be made from it. If you look around your home or school, you'll find most things have plastic in them, including your pencil case, games consoles, and even clothing. The new £5 and £10 notes are also made from plastic. Ok, so far plastic sounds pretty great - and it is. The new waterproof £5 notes are neat and who doesn't like using glitter?! But the problem with plastic is that most of it isn't biodegradable. It doesn't rot, like paper or food, so instead it can hang around in the environment for hundreds of years. Examples of single-use plastic are carrier bags, drinks bottles and crisp packets. More than eight million tonnes of plastic enters the world's oceans each year and most of that escapes from land. It can be blown into the sea from ships and beaches, or carried there by river. Some also gets flushed down the toilet. Another issue is that not all plastic can be recycled. This might be because of the way it is made up or because it is too expensive or difficult to do. Some coffee cups, for example, have a waterproof plastic lining which can make them difficult to recycle. Every day seven million cardboard coffee cups are thrown away but only one in 400 are recycled. How does plastic harm animals? WATCH: What are the hardest products to recycle, and why? Experts think that by 2050, the amount of plastic in the ocean will weigh more than the amount of fish in the ocean. All animals, whether they live on land or in the sea, can be hurt by plastic. They can get trapped in bigger items such as carrier bags or food packaging. 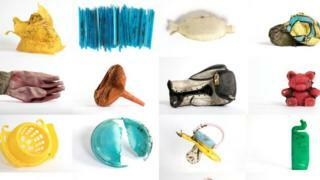 Birds, fish and shellfish can mistake plastic for food when it has broken down in to smaller pieces. One in three sea turtles, and around 90% of seabirds, have eaten it. They can't digest plastic so their stomachs can become full, meaning they don't have room for actual food. Each year, 100,000 animals in the sea are killed by plastic. 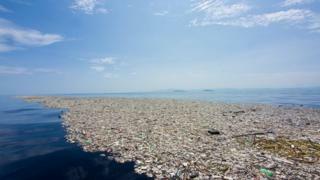 What are 'trash islands' or 'garbage patches'? You might have seen these astonishing pictures of what look like little bits of land in the middle of the sea. When you look closely they're actually made up of floating plastic! 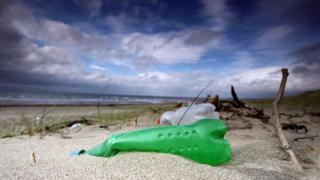 The rubbish includes bags, bottles and fishing gear. These are known as 'trash islands' or 'garbage patches'. They're created by currents in the ocean which carry the waste and bring it together. One of the most famous is the 'Pacific Garbage Patch' between California and Hawaii. There are lots of groups trying to help tackle plastic pollution and cut the amount of plastic we use. Plastic microbeads have been banned from products like face scrubs and toothpaste. And supermarkets are looking at making changes too, including making their packaging easier to recycle or even plastic free. 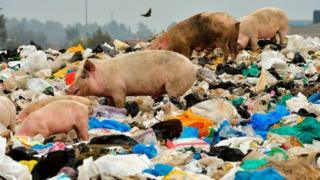 The Government's promising to cut all avoidable plastic waste over the next 25 years. Countries such as Germany, Norway and Sweden have a Deposit Return Scheme and it helps those countries recycle over 90% of their plastic bottles. This means you pay a bit more for a drink in a plastic bottle, but you get that money back when you return the bottle to be recycled. There are plans in Scotland for a Deposit Return Scheme but other parts of the UK aren't convinced. In the UK, just 57% of bottles are collected to be recycled.